From the trail to the taproom to the tidal pool, from the lake to the lunch counter to the lobster shack, let our second (annual?)  scavenger hunt be your guide to everything the Pine Tree State has to offer in the season when it shines brightest. This is your summer to discover something new. Happy hunting. 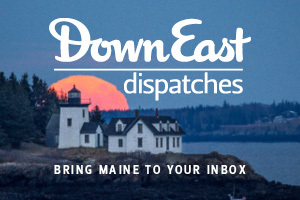 Update: We’ve eliminated Pulpit Rock from the Great Maine Scavenger Hunt because erroneous information was provided to Down Eastregarding public access. A landowner whose intertiedal property scavenger hunters would need to traverse has withheld permission for visitors to access the rock tower. Submitting this selfie is no longer required to complete this category. 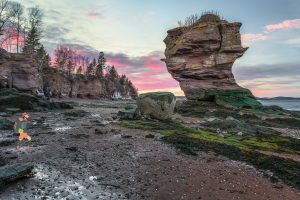 No one can stop you from seeing Pulpit Rock by boat during high tide — if you have the means and abilities, you should still check out this striking Maine landmark. 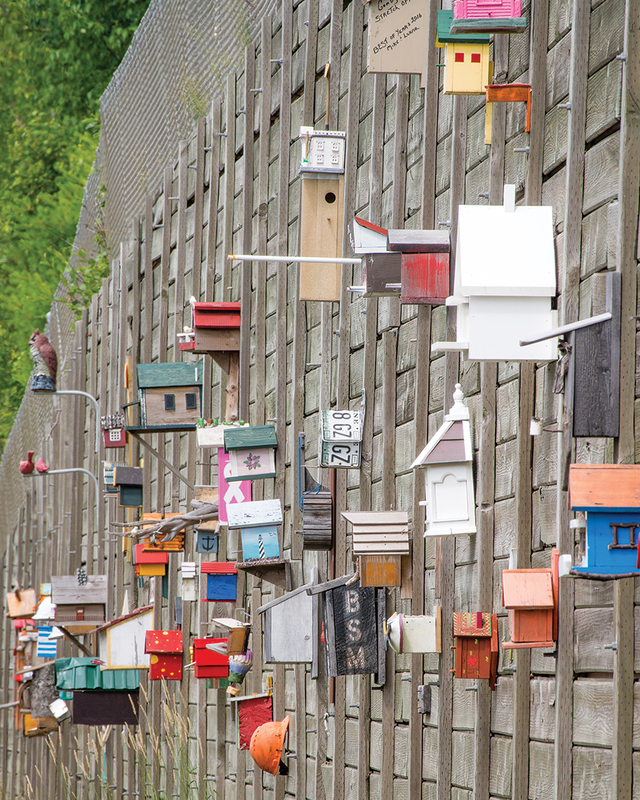 We don’t know what first motivated someone to hang a birdhouse on this wood-plank retaining wall on Route 201 in Moscow, but whoever it was inspired dozens of copycats. Unsuspecting motorists spot a burst of color and whiz by, staring, delighted and/or perplexed. At last count, there were nearly 100 birdhouses, painted to look like churches, log cabins, boats, hot-air balloons, even a miniature White House. Many are signed, often with references to a fine vacation spent fishing and camping in the area. It’s as if the wall were a giant guestbook for the upper Kennebec River Valley. Rte. 201, about 8 miles north of downtown Bingham. ► Selfie: It’s dangerous to pull over and/or walk on the narrow, two-lane Route 201, so give the birdhouses your own drive-by stare, then snap your selfie in front of the Benedict Arnold interpretive placard at the Wyman Lake rest area, about 1½ miles north of the whimsical wall. Inveterate New England beer drinkers know Frye’s Leap as a classic Maine India pale ale, introduced by Sebago Brewing Company back in 1998, when a great piney, hoppy IPA was still a rare find around here. 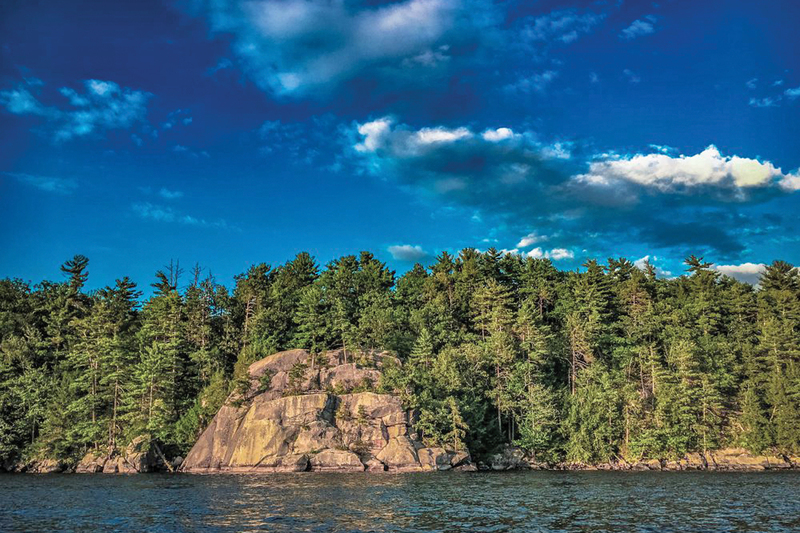 Maine geography buffs know Frye’s Leap as a striking, 50-foot granite outcrop on Sebago Lake. Legend has it one Captain Joseph Frye leapt off the cliff to escape hostile pursuers during the French and Indian Wars. Both SBC’s flagship beer and its legendary namesake have withstood the test of time: the former’s celebrating 20 years; the latter has glacial striations going back, oh, about 30,000. ► Selfie: A shot on the water with Frye’s Leap cliff behind you. Put in a kayak, canoe, or SUP at the Frye Island Ferry terminal at the south end of Raymond Neck, then follow the shoreline just over a half-mile east. Rent a boat from Sebago Trails Paddling Co. in Raymond (207-894-4696). Powerboats and sailboats work too. Stay off the cliffs, as they’re super dangerous and private property. You’ll probably want a beer after, so swing by SBC’s nearby new brewery and tasting room (616 Main St., Gorham; 207-856-2537) or find a Frye’s Leap near you with SBC’s handy beer finder. 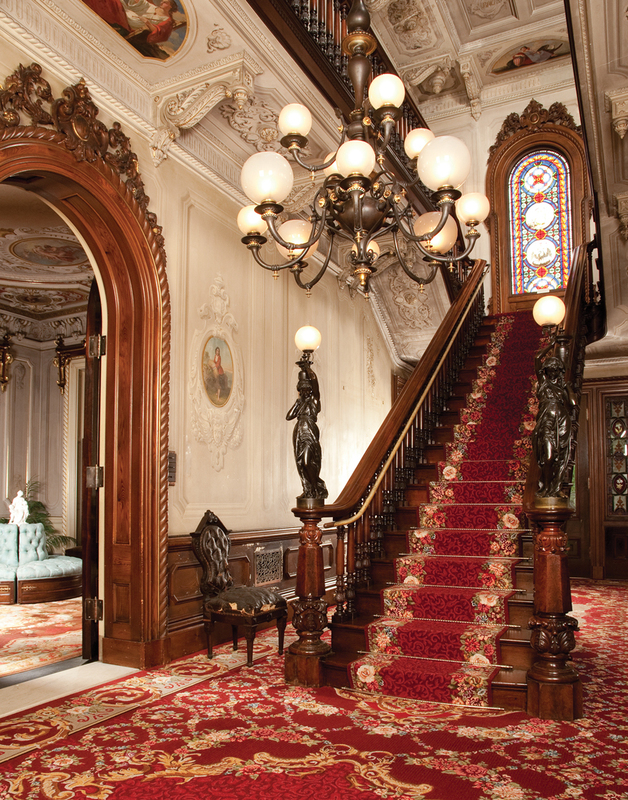 Victoria Mansion is among the most impressive and finest preserved mid-19th-century houses in the country, thanks to its imposing brownstone tower, richly painted interiors, and thousands of objects — silk flowers to wine glasses — that belonged to its original owners. Conservators are currently restoring the reception area to its original brightness, the latest in a long line of preservation projects. Meanwhile, special events ensure that repeat visitors experience the mansion in new ways. Coming up: Fashion in the Victorian & Early Edwardian Age (May 1–31), an exhibit of women’s dress and accessories; an annual block-party (June 29) celebrating the release of a Victoria Mansion–inspired Allagash ale (made with wine grapes); and Opera at the Mansion (July 16), a Mozart-themed evening with Opera Maine singers performing in the stair hall. 109 Danforth St., Portland. 207-772-4841. ► Selfie: Stand anywhere out front and get a shot alongside this National Historic Landmark’s grand windows, doors, or Ionic columns. On the road to Baxter State Park from Millinocket, you almost always have a great view of Katahdin, but maybe the loveliest vantage point is from next to the Pockwockamus Rock, otherwise known as the “Keep Maine Beautiful” rock. Tired of finding graffiti and trash at the site, campers in the Maine Youth Conservation Corps set out to paint the giant rock, about a mile east of Baxter’s south entrance, in 1979. Decades later, their scheme seems to have worked, and the rock remains an attraction in its own right, with visitors regularly stopping to pose alongside it. It’s needed a little freshening up over the years, and volunteers have stepped up to care for it, including celebrated Maine artists Abbott and Nancy Meader, who tended to the mural for more than two decades. It looks as spiffy as the day it was painted. 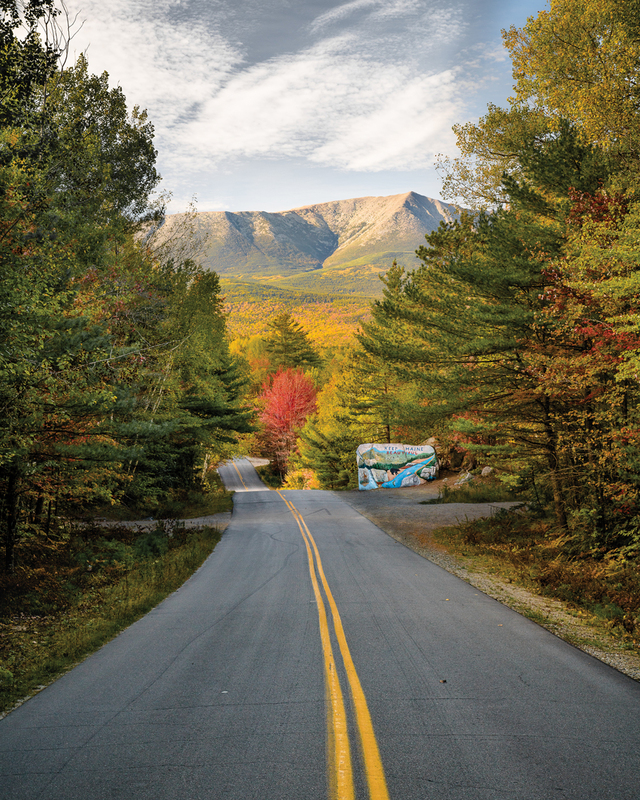 ► Selfie: Pull over, gape at Katahdin, stand by the rock, snap the pic. And keep Maine beautiful. Ready to upload some selfies?